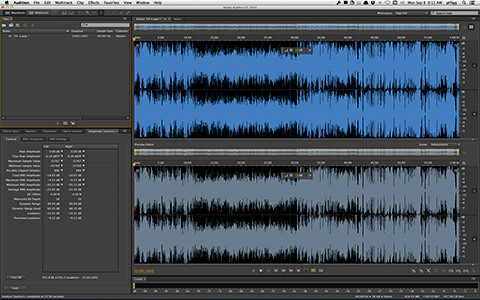 In my previous article I discussed various aspects of the Match Volume Processor in Adobe Audition CC. I mentioned that the ITU Loudness processing option must be used with care due to the lack of support for a user defined True Peak Ceiling. 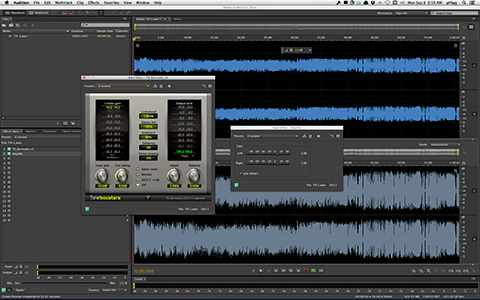 I also pointed to a video tutorial that I produced demonstrating a Loudness Normalization Processing Workflow recommended by Thomas Lund. It is the off-line variation of what I documented in this article. We will be shooting for the Internet/Mobile/Podcast target of -16.0 LUFS Program Loudness with a suitable True Peak Ceiling. The first step is to run Amplitude Statistics and determine the existing Program Loudness. In this case it’s -15.88 LUFS. Next we need to Loudness Normalize to -24.0 LUFS. We do this by simply calculating the difference (-8.1) and applying it as a Gain Offset to the source file. The next step is to implement a static processing chain (True Peak Limiter and secondary Gain Offset) in the Audition Effects Rack. Since these processing instances are static, save the Effects Rack as a Preset for future use. Set the Limiter’s True Peak Ceiling to -9.5dBTP. 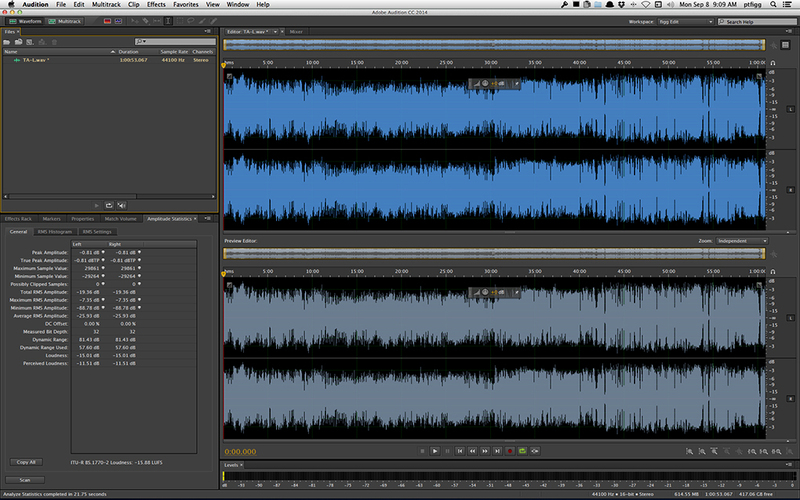 Set the secondary Gain Offset to +8dB. Note that the Limiter must be inserted before the secondary Gain Offset. Process, and you are done. In this snapshot the upper waveform is the Loudness Normalized source (-24.0 LUFS). 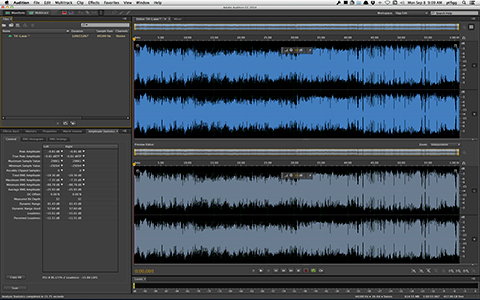 The lower waveform in the Preview Editor is the processed audio after it was passed through the Effects Rack chain. In case you are wondering why the Limiter is before the secondary Gain instance – in a generic sense, if you start with -9.5 and add 8, the result will always be -1.5. 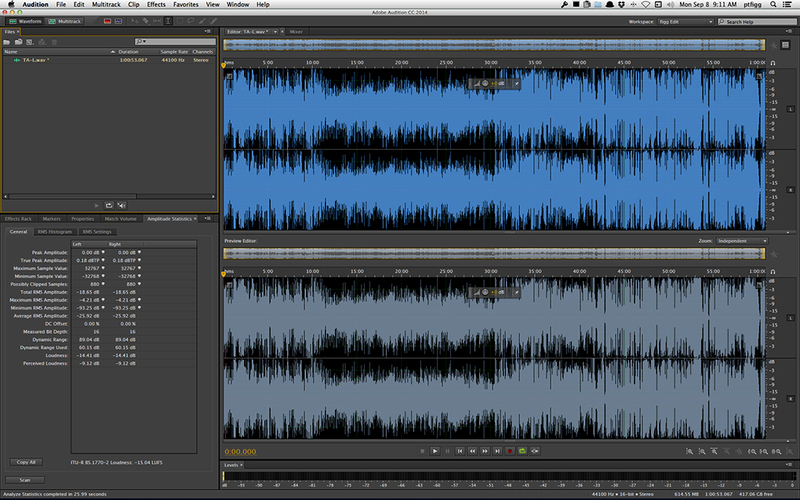 This translates into the Limiter doing it’s job and never allowing the True Peaks in the audio to exceed -1.5dBTP. In essence this is the ultimate Ceiling. Of course it may be lower. It all depends on the state of the source file. [– Determine Program Loudness of the source (Amplitude Statistics). 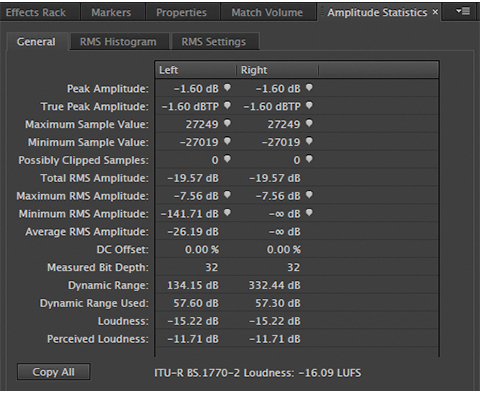 [– Loudness Normalize (Gain Offset) to -24.0 LUFS. [– Run your saved Effects Rack chain that includes a True Peak Limiter (Ceiling set to -9.5dBTP) and a secondary +8dB Gain Offset. Feel free to ping me with questions.